Posted on 12/19/2018 by Mark Engleson	in Live Review and tagged 9:30 Club, Atlanta, blues, Cat Power, Chan Marshall, folk, Georgia, neo-soul. You could truly say that of Cat Power at 9:30 Club on Sunday. But in the past, that wasn’t a comment one might expect to hear at her show. Although she’d long produced great work in the studio, indie rocker Chan (pronounced Shawn) Marshall’s live sets had a tendency to go off the rails. Before she got sober, alcohol compounded Chan’s stage fright, which she faced by taking the prescription anti-anxiety drug Xanax — the two do not mix especially well. Getting clean and sober is just one change in Chan’s life. On her heavily-anticipated 10th album, Wanderer, published in October, she reflects on becoming a mother, and on healing from physical and mental health challenges. The blue-eyed/neo-soul of Wanderer differs markedly from the electronic sound of her previous album, 2012’s Sun, and it is making inroads with new audiences. The bible of roots music, No Depression, turned its eyes on Cat Power. Wanderer made my top 10 albums of the year. A fan mentioned that she felt that Chan was on the cusp of a mainstream breakthrough with her 2006 album, The Greatest, and I think she’s there now again. 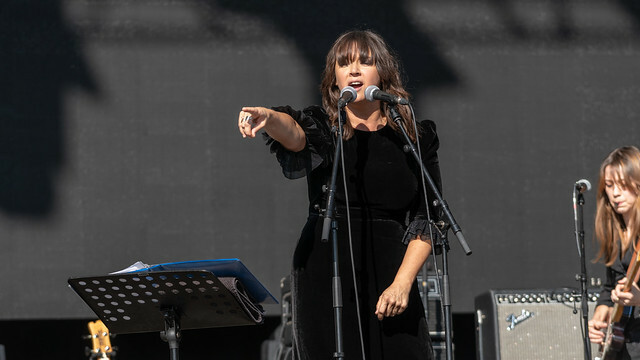 “Woman” has been described as a feminist anthem, and Wanderer as a feminist album. Chan notably surrounded herself with a majority-female band, with a female bassist and drummer, and a male keyboardist/guitarist. Another woman joined the band on additional guitar for some pieces. From my perch at the upstairs bar, Chan appeared as almost a shadowy figure on stage. As much as the violet light illuminated Chan’s long black dress and raven hair, it added an aura of mystery. Cat Power went for and nailed the classic, hazy chanteuse in a nightclub appearance, only brought to the larger scale of the 9:30 Club. Chan’s lack of banter only added to her mystique. At the end of her set, Chan picked up a bouquet of flowers. In contrast to the indignities of early performances, Sunday’s performance was elegance and pure class. “I just love her love,” said my friend Jessica. Cat Power’s husky voice has never sounded more rich and full-bodied. As she finished her set and told the crowd not to let themselves get caught up with people who don’t really care about them, I felt glad for Chan Marshall — that she has found a more peaceful place in life. And I was delighted to enjoy the art that she’s making there.